Gouarec is large and grassy, very natural and with very much the feel of a 'proper' campsite. Increasingly campsites in France have become glorified villages of chalets and mobile homes, our aim at Gouarec is to do the complete opposite. 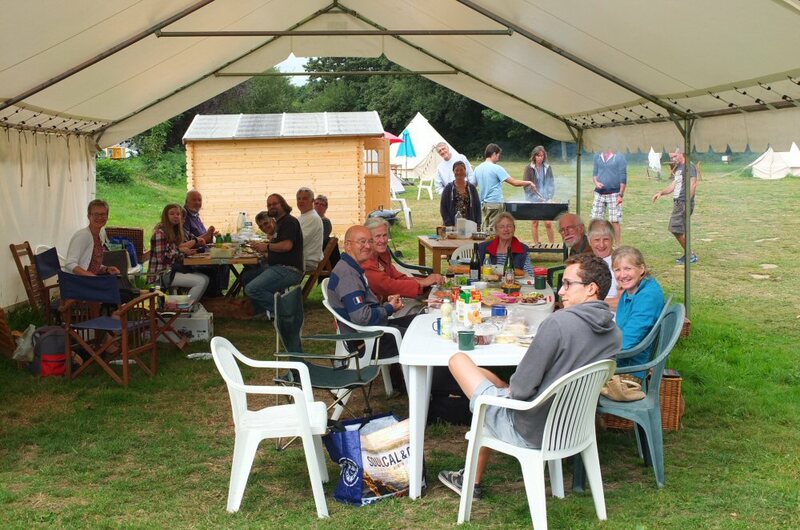 For those who do not come with their own tents, caravans and camping cars we have installed shepherd's huts, classic caravans and large canvas tents. For those looking for something more solid within 500m of the campsite we have our lock-house/bunkhouse and two beautiful gites for hire. So in Gouarec campsite you'll find open spaces, communal campsite kitchens that anyone can use, covered areas with picnic tables where people mingle and talk and eat whilst children can just explore in safety. You'll find big fire pits where you can sit around a roaring fire on a chilly summer evening, or borrow one of our barbeques to cook up something from the village butcher. Our bike-hire fleet contains many vintage-style bikes, the campsite has a 2CV for hire for a real taste of French motoring in the '60's.